The traditional version is wrapped up in flaming colors of red and packs some heat. I decided it would be a nice change of pace to impart a more familiar and comforting flavor with some deeply marinated chicken teriyaki with the sauce running throughout the dish. It’s slightly reminiscent of the royal court rice cake dish but has a unique style, all on its own. My mama and I both hope you’ll try it. In a bowl, soak the rice cakes for at least 20 minutes in cold water. Rinse, drain, and set aside. In a large pot, bring the water, onion, garlic, kelp, carrots, and soy to rapid boil then lower the heat to simmer. In another bowl, soak the chicken in the soy, mirin, brown sugar, ginger and pepper. Boil the stock and marinate the chicken both for at least an hour. In a pan glazed with sesame oil, cook the chicken (with all it's juices), and toss in the rice cakes. Pour in the stock one ladle-full at a time. As it cooks, the sauce will thicken, add more or less stock depending on preference. Hi Angela, interesting chicken dish… something new to me but it sure look delicious. Thanks for sharing the recipe. Nice video. A very delicious fusion rice cake recipe, Angie. I’ve never had anything like this but I do like Korean food so I think I can polish this off! It’s very easy to gobble up…a take on terikyi chicken with rice, if you will. Oooh, I think I like your hair with pink the best! So cute how it matches your shirt. 🙂 I really want to taste those rice cakes – I never heard of them! Well I’ve heard of Quaker rice cakes, but that’s another story. It’s fading fast but whatev, lol..mom is addicted to those things! 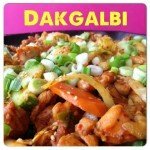 Is Korean rice cake dried or frozen? 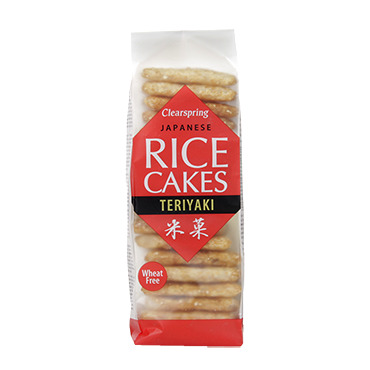 Are they the same as Chinese rice cake? It’s dried out (and sometimes stored room temperature on the shelves, in the refrigerated section or in the freezer) I know, it’s a bit confusing but either way it comes, it “rehydrates” fast and a bit of liquid brings it back to its chewy and tender state. Please, don’t tempt me with rice cakes! I could eat the whole package in one day! I love them in every possible way, but always in a hot sauce. Excellent fusion idea! I’ve been hearing about psy’s new song everywhere..must go hunt down the video to see what all the fuss is about, lol. What a creative combination of flavors! yummm. one of my fave go tos for my girls! xO! It was one of mine too, growing up. 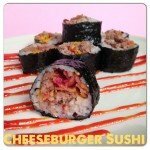 Not sure I have had Korean rice cakes but this looks amazing, I am always so impressed by your great fusions. Thanks again for another wonderful recipe and video Angie! That looks so delicious! I know it smells heavenly! ANOTHER MUST TRY! You and your Momma make a great team and are so lovely Angie! I LOVE FRIED chicken skin lol!! Have a great day! I’m kind of regretting not crumbling fried chicken skin bits on top now, LOL! 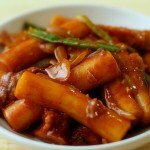 I enjoy Korean rice cakes..this one sounds so yum..tell your mom, we’ll surely try it and for sure love it. I most definitely will, thank you! This dish is gorgeous, I love the colors! i love those little rice cakes! 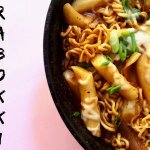 Such a fun fusion dish!